Our guide will pick you up shortly after breakfast in your hotel in Sharm El Sheikh, travel for approx. 2.30 hours with modern private Land Cruiser to uncover the Colored Canyon near Nuibaa Bedouin Village. 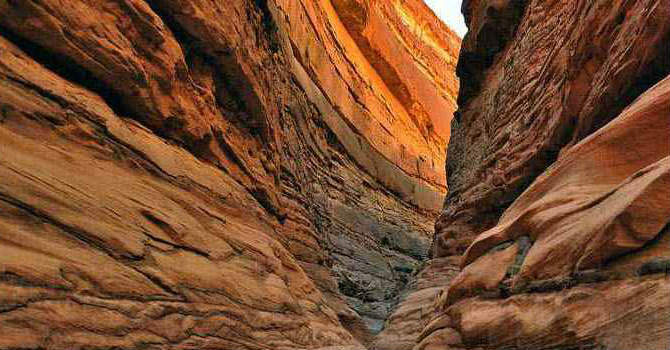 Enjoy one hour walking throughout the Canyon, wandering the gorgeous colors and shapes of the mountain rocks. Continue to visit the famed monastery of St.Catherine located at the foot of Moses Mountain, it has been constructed in the fourth Century. The Biblical Burning Bush lies within the walls of the monastery, Moses Well and the famous orthodox church of Transfiguration. Get short refreshment break for lunch then drive to Dahab city to stroll this past small Bedouin village and purchase some cheap souvernirs before returning back to your hotel in Sharm El Sheikh.